an apparatus specially designed for care of patients with injuries of the spinal column or cord. It is constructed of pipe and canvas and is designed so that the patient can be turned without difficulty. The frame on which the patient lies while in the supine position is called the posterior frame; the anterior frame is used when the patient is turned on the abdomen. There are perineal openings in both frames for use of a bedpan. a frame that secures the patient in position and permits turning in various planes without individual motion of parts. 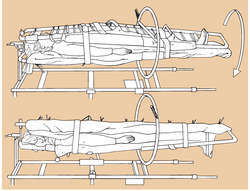 A frame that holds the patient and permits turning in various planes without individual motion of parts. A device that supports two rectangular pieces of lightweight but strong material so that one side is on the anterior surface of the patient and the other is on the posterior surface. The patient is sandwiched firmly between the pieces of material. The device may be rotated around the patient's long axis. This permits turning the patient without his or her assistance. After a turn is completed, the uppermost portion of the frame can be moved away from the patient. See also: Stryker, Homer H.
Homer H., U.S. orthopedic surgeon, 1894-1980. Stryker saw - a rapidly oscillating saw used for cutting bone or plaster casts.